God created the Heavens and the Earth. Then what happened? Genesis 11:27-12:20, Introduction to Abram and Sarai. Genesis 16, Sarai gets impatient. Genesis 17, God changes Sarai’s name and promises her a child. Genesis 18:1-15, Sarah laughs; 20:1-18, Sarah is protected. Genesis 21:1-21, Sarah laughs again. Genesis 23:1-20, Death of Sarah. Have you ever had the misfortune to get involved in an interminable series of novels? You know — first book comes out, and you read it. Hmm. No ending. So you read the second book. Still no ending, but hey — it's probably a trilogy, right? Third book — no ending. My husband got disgusted and quit one of these series after eight books, and several more installments have come out since then! Somebody should tell these writers that novels are supposed to have a beginning, a middle, and an end. Our Bible is actually 66 books, put together over the centuries into the "Christian canon," that is, the accepted books of holy scripture of the Church. Even though it's not a novel, the canon as a whole has a beginning, a middle, and an ending. In the beginning, God created everything, and it was good. In the middle, our sin messed everything up. In the end, God will restore creation to the goodness it had in the beginning. Excellent plot! If you haven't read the book, start today. One of the all-time favorite children's stories, both inside and outside the Church, is the story of Noah's Ark. Usually the stories start with the building of the ark, or with the animals coming to Noah, two by two. The real story for grownups starts a few chapters earlier, with the human sinfulness and violence that drove God to such a drastic measure. Today and for the next two days, we are reading about one of the great themes of the Bible: Abraham is blessed to be a blessing. Abraham is chosen to be an instrument of God's plan of salvation for the world. First, Abraham and Sarah must go with God into a foreign land, where they will grow into a great nation. They will be so blessed that they will be a blessing, and through them all the families of the earth will be blessed. This nation of Abraham and Sarah's physical and spiritual descendants, God's people, is where we have our own citizenship. Genesis 12:1-3 has been called "the topic sentence of the Bible." God does not bless us because we deserve blessing, or even because we are the most deserving of an undeserving bunch. God blesses us so that we can be a blessing to others. Thanks be to God, who lets us participate in his plan for salvation of the world! God reiterates his earlier promise that Abraham and Sarah will become a great nation and makes a covenant with them; part of the covenant is that this very elderly, childless couple will be so fruitful that their descendants can't even be counted. Abraham's faith that God will fulfill this promise is counted as righteousness. As Paul points out, this applies to us, too. We have no righteousness of our own, but our faith in Jesus Christ is counted as the righteousness we need to be saved. The covenant that God makes with Abraham is a suzerainty covenant, that is, a contract between unequal parties. The pieces of the animals were a standard part of similar covenants between kings and lesser figures. The vision that Abraham sees of the fire pot and torch passing between the pieces of the animals also reflects the procedure for the earthly covenant. God uses this physical and visual process to assure Abraham that he will be faithful to his promise. After Abraham has spent many years in God's presence, God changes his name. "Abram" becomes "Abraham." This is a play on words, because "Abraham" sounds similar to "father of multitudes" in Hebrew. Sarah's name is changed from "Sarai" to "Sarah," which means "princess." Abraham and Sarah are two of a small handful of people whose names are changed by God. God is saying to these people, "I have a special job for you. Your new role will be so different that your old name doesn't fit any more." Paul comments on this passage in Genesis in his letter to the Romans. See Romans 4:1-5. We have a new baby in our family. Her middle name is Siobhan, which is Gaelic and is pronounced Sho-vahn. She is named after her mom, Shoshanna, and her grandma, Yvonne. Many, many of the babies in the Bible have names honoring some significant event connected with their birth. Abraham and Sarah named their baby "Isaac," which means "laughter," and you will see in today's reading why he was called that. We need another law lesson. 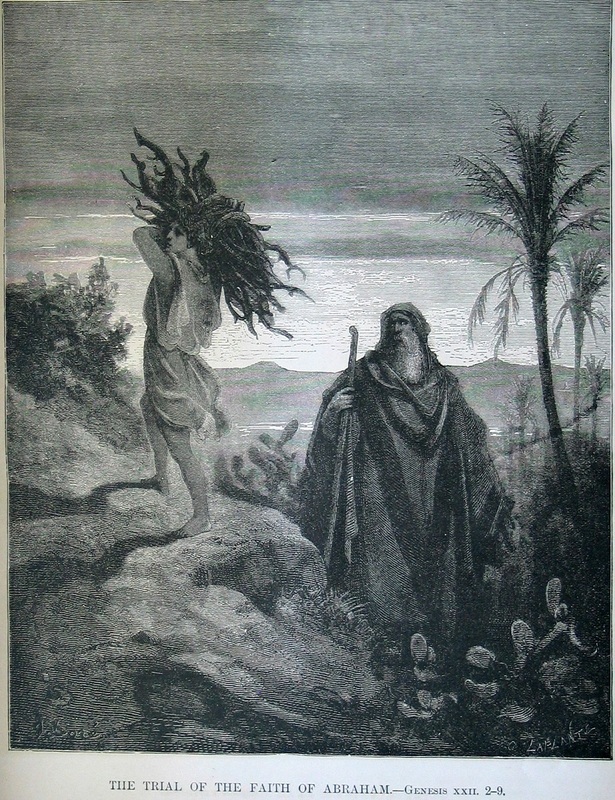 What's up with Sarah, that she throws Hagar and Ishmael out of the house? This seems pretty harsh, especially after she got a son of her own. Well, here's the thing. Hagar was Sarah's slave, and Sarah (getting along in years and doubtful of the LORD's promise that she and Abraham would have descendents) had given Hagar to Abraham as a concubine in order that she, Sarah, could have a child by adoption. Then Isaac turned up, past all hope and expectation. But the law was that the child of a slave woman and her owner must either be freed or must inherit equally with the legitimate children. Sarah wanted no part of splitting up God's promise of blessings, a mighty nation, and a land. She wanted that for Isaac. Therefore Hagar and Ishmael had to be freed. 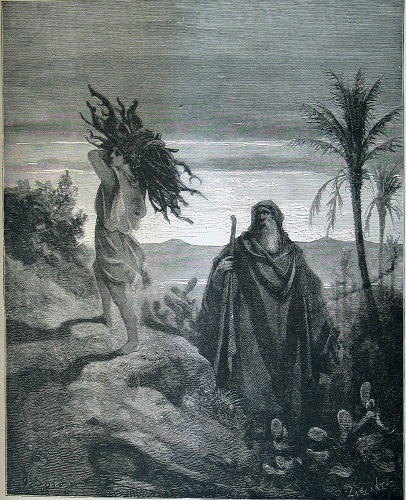 The psalm seems like the sort of thing that Hagar and Ishmael may have prayed in the wilderness. It pretty much boggles our minds that Abraham would even consider this proposition; however, child sacrifice was actually very common in that time and place. God put an official stop to it for his people, as recorded in today's passage. The practice continued for another 1000 years or so in Palestine, both among the non-Jewish peoples of the area and among a few really backsliding Jews. Just out of curiosity, I searched on the web for images of the sacrifice of Isaac. The vast majority of them show the dramatic intervention of God when the angel stops Abraham from harming his son. There’s nothing wrong with that – it certainly is the climax of the story. Gustave Doré, however, has given us the much more poignant image of Isaac carrying the wood for his own sacrifice, and I actually prefer it to the others. How difficult it must have been for Abraham to leave his servants and take his child up the mountain! His path is thorny, but his eyes aren’t watching the path, they’re turned toward the boy. This illustration is labeled, “The Trial of the Faith of Abraham,” and I think that’s right. The real trial took place as he took his beloved child to the place of sacrifice, believing that God would intervene. "The Trial of the Faith of Abraham" by Gustave Doré, from the Gartin family Bible, now in the private collection of Regina L. Hunter. We are largely a nation of immigrants. With very few exceptions, first-generation immigrants speak the old language and keep the old ways. Second-generation Americans understand the old language but don't speak it, and they keep the old ways only when they are around the old people. Third-generation Americans don't know either the old language or the old ways. Abraham and Sarah wandered for many years in the land that God promised would someday belong to their descendants. They were immigrants. One of the conditions of God's blessing was that they be separate from the other Canaanite peoples. These peoples worshipped a lot of very unattractive, immoral, unethical, nasty gods, and God knew that if Abraham and Sarah's descendents intermarried with the people, they would soon come to worship those gods. In his very old age, Abraham sent his foreman back to the old country to get a bride for Isaac. Notice that Rebecca’s family asked her if she was willing to go, and she got the lion's share of the bride price. That was the law. We normally think about today's reading from the point of view of Jacob. No question--Jacob was a conniving sort of fellow who bought the birthright and stole the blessing that belonged to Esau. But let's look at this from the point of view of Esau. Here is a healthy young man, a little tired and frustrated from an unsuccessful hunt, no doubt hungry, who is willing to sell his birthright of God's promise of land, nation, and blessing — and not just sell it, but sell it cheap. What a short-sighted, self-centered fool! Jacob valued that same blessing enough to cheat and lie. The Psalmist valued it enough to say, "I never forget your teachings, although my life is always in danger. ... They will always be my most prized possession and my source of joy." See also Psalm 119:105-112. Remember sneaky Jacob? After trading lunch for Esau's birthright, he and Rebecca plot to steal (sorry, there's no other word for it) Esau's blessing as well. This didn't go over very well with Esau, so Jacob has to leave town in a hurry. Rebecca suggests to Isaac that Jacob should go back to the old country to find a nice girl, not like the two local girls whom Esau married and who are driving her crazy. So today we see Jacob on the lam. Something unexpected happens to him: the blessing that God promised to Abraham and Isaac is now promised to Jacob. A number of Old Testament patriarchs and religious and political leaders had multiple wives and concubines. This was accepted practice, although the OT writers raised their eyebrows slightly over Solomon's 700 wives and 300 concubines. Eventually the rabbis forbade multiple marriages, not on the grounds that it was forbidden by scripture, but on the grounds that a man could not be fair to multiple wives. Jacob, whose two wives and two concubines built the house of Israel, loved Rachel more than Leah. Today we have some more of those names that seem totally mysterious until you know what they sound like or mean. "Isra-el" sounds like "he strives with - God." "Peni-el" means "face of - God." In our culture, we have a saying, "What's in a name? ", and the implication is, "Not much." In many other cultures, names are important because they have power. In our own state, for example, the true name of a Navajo person is only known to a tiny number of people. In today's reading, Jacob's name is changed. Only a few people in the Bible have their names changed or determined in advance by God, and in every case, it is either a symbol of a significant, life-changing event or a prediction of the role that that person will play in history. In the case of Jacob, both of those reasons are important. In our reading today, Jacob's name is changed after he literally comes to grip with God, and his new name characterizes the relationship between the children of Israel and God for more than a thousand years. We are accustomed to the idea that the New Testament presents the facts of Jesus' ministry many times in several styles: four gospels, one history of the early church, numerous letters, and a vision. Most of us are less aware that the same thing happens in the Old Testament. For example, 1 and 2 Chronicles repeats 1 and 2 Kings, but with much more emphasis on the Temple and its liturgy. Today we read twice about Joseph. The Genesis account is a report of what happened; the excerpt from Psalms 105 is a poetic commentary on why it happened. See also Psalm 105:1, 5-6, 16-23. By the way, "Pharaoh" means almost exactly "White House," as in "Today the White House announced...." It started out as the name of a building, and ended up as the title of the ruler. Copyright 2007, 2008, 2009, 2010, 2011, 2015, 2016 by Regina L. Hunter. All rights reserved.